We renovated this entire brownstone, completed in 2007 for NYC pillar and father of three daughters, Ricky Kenig, the owner and personality behind the Ricky’s NYC stores. Ricky was interested in creating a modern haven for his family, in a beautiful Brooklyn brownstone: a place that offered private retreat spaces as well as open mixing spaces to spend time together. The program of spaces was organized by floor. The basement was finished to become a casual family den-type room with a pool table and couches, etc. The ground floor level was opened up to become a loft-like living room and kitchen with an exterior wood deck floating outside, over the backyard. The second floor became the girls’ floor with bedrooms, a study, kid-lounge and bath. Bachelor retreat was the idea of the third and top floor, with a home office, bedroom and bath. Tying the home together, the stair acts as a spine from basement to third floor. We were interested in allowing this to read as a distinct element and so structured it to rise free of the adjacent walls. A new skylight was inserted into the roof, above the stair, accentuating the vertical rise and bringing natural light down into the home. The wall behind the stair was finished with sheets of blackened steel that run continuously from the parlor level to the roof. Display elements can be easily affixed to the wall using magnets. By creating an entirely flexible “canvas of metal” we offered a space with infinite possibilities for visuals. 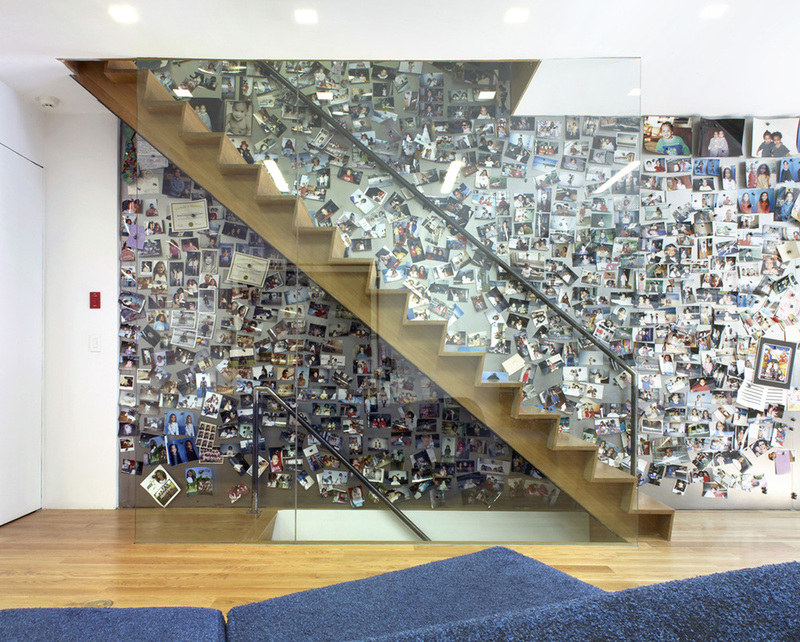 The flexibility of the magnet wall fosters the creation of zones organically, as people affix items of interest to them at their own floor—alternately the entire stair could be rigorously curated. We felt that the flexibility of the display wall mechanism was appropriate particularly for a family so rooted in a retail tradition. In the kitchen, the color palette is focused on black and silver. Countertops are Absolute Black granite with a laminate on upper cabinets and island that features an abstract aluminum pattern on a black background. Mid level cabinets and security doors are aluminum sheet, with a custom pattern of circles and ovals that creates an optical illusion that the sheet is bowed out when in fact it is entirely flat. The pattern was designed by Slade Architecture and water jet cut into the panel. The girls’ floor offers real flexibility as the rooms can be opened or closed with large sliding doors. 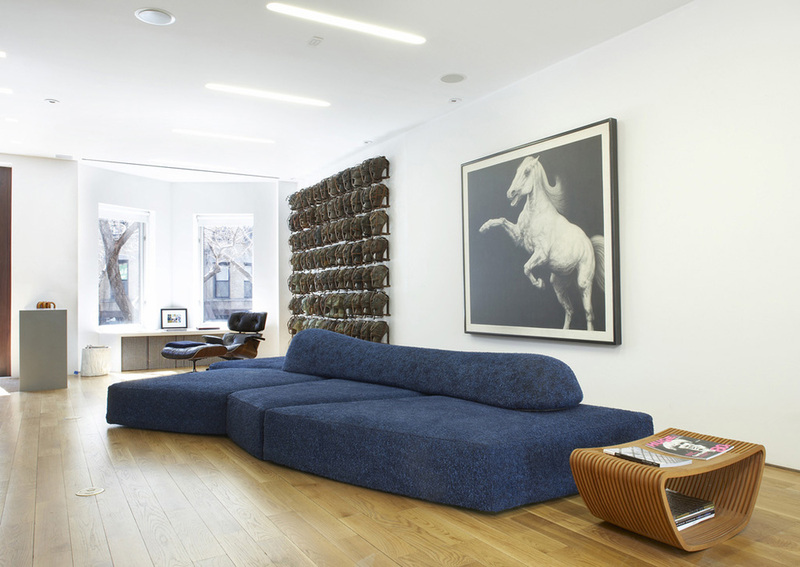 In the open configuration, the entire floor is open—like a loft space. By closing the doors, the girls can create a traditional closed bedroom space. The bathroom on this floor has a playful tile combination that mixes graphic tiles of a grass lawn with green glass cobbletones tiles. At the top floor, we designed a retreat for Ricky. There is a home office and extensive closet/dressing area as well as bedroom and bathroom. An extensive collection of rare shoes is featured prominently immediately adjacent to the stair entry on the floor, below the skylight. We felt that it was such a committed interest that the collection should receive a preferential place in this private zone. The “shoe wall” as we called it became an important personal expression as well as a unique decorative element.